A lamp is supposed to lighten up your room and premises. They come in a large variety, sometimes they are made of some metal and they are also made with the wood. These huge and tall wooden lamps and clocks are just a sort of signature for any art loving person or the one who loves to decorate his house in a very distinguished manner. We have seen a lot of side table lamps that we place in our bedroom, but there are also some huge wooden lamps which are placed anywhere in the room like a center piece and also to lighten up the room. Following the same pattern today we are going to present you a pallet wooden upcycled lamp. 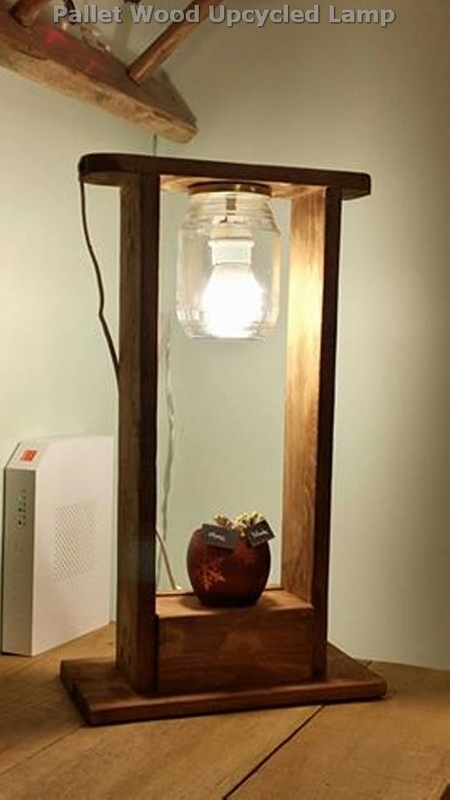 Though it would be pretty simple in its design and appearance, but you still have to follow some standards relating to a vintage pallet wood recycled lamp. If we look at the basic structure of this pallet wood lamp this is pretty simple tall and erect. Just two wooden pillars are joined together covered with a circular top and a wide stylish base. Its distant look appears to be a wooden pallet cabinet or shelf. But actually it is a huge pallet wood recycled lamp. Its design is the simplest one and it would be pretty handy to make for any art crafter or pallet lover. The lamp bulb is installed on the top of the pallet wood lamp hanging inside the lamp frame. While on the base there is a wide base where you can place a vase or any other center piece. Well, you can also paint it according to your room interior so that it complements the rest of the room interior. This would be a great addition to your home wherever you place it.